Merry Christmas from East Pasadena. Rain delayed our annual tour of the Hastings Ranch neighborhood. But, earlier this week we had a chance to make the normal rounds. This display on Ranch Top Rd. was one of the religious theme winners. Every year I marvel at the displays in Hastings Ranch. The displays themselves are fun. But, to me the most amazing thing about it is the show of neighborliness. There are 1100 homes in this neighborhood and, driving around, it looks like nearly all of them participate. Remarkable. Really, where else have you seen so many neighbors pulling together to present such a show? They've done this since the 1950's. More than 50 years of neighbors coming together to put on Christmas displays. What a great tradition. Upper Hastings Ranch (north of Sierra Madre Blvd.) was largely developed in the early 1950's. Modestly priced homes were offered on favorable terms and young families clamored to get in. According to longtime Ranch resident and current mayor, Kathy Gregg, the neighborhood was known as Rabbit Hill due to the number of children. The folks of Rabbit Hill were a congenial bunch. With all the kids around, they started coordinating displays at Christmas time. Kathy says the whole thing got started with luminarias (paper bags and votive candles) lined up along parkways. Turns out some in the neighborhood were Hollywood types and took things to the next level. Last year Pasadena Adjacent (I'm astonished at what they know over there) commented that set designers helped get the displays started. Apparently the designers' creativity combined with lots of community spirit to produce Christmas displays that were set up along the neighborhood's parkways. Wikipedia says the whole tradition was in place by 1957. The year was 1878 and it was Christmas-time at the Sierra Madre Villa Hotel. Only five years earlier, noted painter William Cogswell had purchased 473 acres of wild mesa land in the vicinity of present day Eaton Canyon Golf Course. After Cogswell's purchase, the hard work began and the property was soon transformed into one of the west coast's preeminent resorts. Cogswell's son-in-law, William Porter Rhoades, supervised the work and was the proprietor of the hotel. Rhoades was captivated by the Villa's setting in the foothills of what were locally known as the Sierra Madre or Mother Mountains. And you can imagine the magic he saw as he looked south -- green orchards and vineyards stretching out in the valleys below and ocean views in the distance. He wanted to create the most beautiful spot in southern California. Rhoades embarked on an ambitious scope of work. He hired 75 Chinese workers, whom he housed on site in a bunk house. They cleared the land of chaparral that was reportedly so dense a rabbit couldn't pass through it. They piped water down from Davis Falls to the property, built a reservoir, installed irrigation and then planted the orchard and vineyard. Rhoades hired a carpenter to build a house for his family, which is pictured above and is the subject of an earlier post. 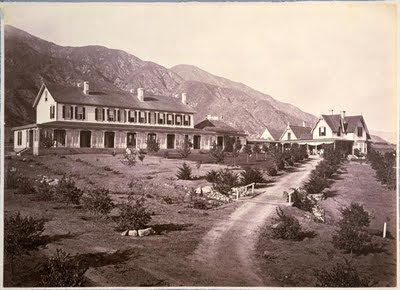 By 1877, the 20-room Sierra Madre Villa Hotel was completed. The hotel provided luxury accommodations for the day -- boasting running water to each room, a wide veranda and spectacular views. Rhoades kept the Chinese workers on as hotel staff and to maintain the Villa property. Now, Rhoades and his wife, Jennie, had children including a young son named William Lauren Rhoades. 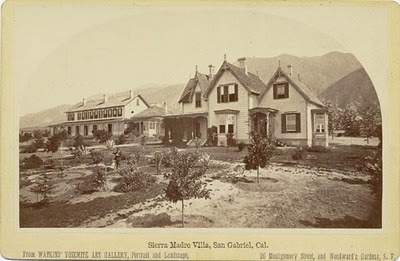 The younger Rhoades grew up at the Villa and later recounted his memories in a short book titled The History of the Famous Sierra Madre Villa Hotel. In his book, the younger Rhoades describes Christmas at the Sierra Madre Villa Hotel in the late 1870's. When Christmas time rolled around the real fun began. I will describe a typical Christmas day in the late seventies. The day before Christmas was one of excitement for all were preparing the gifts, some driving into Los Angeles, a thirty mile drive, to get the last few gifts needed and to shop for all the rest and only about two dry goods stores, two book stores and a few other places to purchase but that made it all the more exciting. There was a tree to sit up fully nineteen feet high, that was the height of the ceiling, and a spread of branches in proportion. Then the trimmings, popping the corn and putting on the cornucopias, hanging the glass balls and the angel on the top. That day the Chinese boy, Sam, made mysterious trips to Mother's room with packages coming from the servants and Chinese on the ranch. Rhoades goes on to describe the evening festivities. The Rhoades family, Chinese workers and hotel guests all participated. To the guests' delight, the Chinese workers would enter the hotel parlor with a flourish. Dressed in fine silks, their heads were freshly shaved with their "cues" hanging down their backs and red ribbons braided into their hair. They came bearing gifts of sweet lichi nuts, ginger and dainty cakes. In turn, the workers were presented with a fattened pig for roasting. It must have been quite a show. The evening also included traditional Christmas carols after which the tree was "stripped." This Sunday brings the third Altadena Urban Farmers Market. It all starts at 1 pm at the Zane Grey Estate, at East Mariposa St. and Marengo Ave.
You can go to the market's Facebook for the latest information about vendors. Prolific blogger Victor Caballero has a great review of the October market here and photos of the November market here. This market is something you really should do. You'll be supporting an emerging local economy and, even if just for a moment, disengaging from all the wasteful trappings of commerce as we typically know it. You'll find wonderful handmade foods and products - all locally produced and all first rate. The folks who run this thing make the best goat cheese in the county and they've scouted out other top quality local vendors. The range of offerings has expanded each month, but already includes cheese, coffee, honey, breads, garden produce, eggs, plants, soaps, bbq sauce, granola, and home remedies -- all of which you can purchase directly from the person that made the product. It doesn't get any better than that. And, when you go, please visit my wife's table. Marcia has a line of items that she's made for our family for years and is now offering through her new business, HomeBody Botanicals. It is all nontoxic and all made right here in our kitchen. So far, she offers detergent, household cleaner, salves and skin treatments. She will also have her Fire Cider, a traditional anti-cold remedy that has been infusing for weeks. It is strong stuff, but works when you've got a tickle in the back of your throat. It had been a busy day. While working in the yard, I watched hummingbirds and bees flying around the lemon tree. I heard them buzz by me a couple of times. Hummingbirds are interesting little birds. They feed by opening their beaks slightly to allow their long tube-like tongue to slip into the flower for nectar. I've never seen this, but hummingbirds also eat insects by nabbing small bugs in flight or picking them off of spider webs. If you're prone to hyperventilation, you don't want to hang out with a hummingbird. At rest, they take about 250 breaths per minute. Their little heart races as fast -- up to 1,200 beats per minute in flight. There is a lot interesting hummingbird history. Hummingbirds don't exist in the Eastern Hemisphere. So, when Europeans arrived in the Americas, they had never seen anything like these colorful little birds that could fly every which way. The Europeans were fascinated. Columbus was so impressed that he presented the Pope with a hummingbird skin. By the 1800's hummingbird skins were popular items in Europe. According to Hummingbird World, millions of hummingbird skins were shipped from South America to Europe for use in artificial flowers, dust catchers and ornaments. Hummingbirds were also hot fashion items. Seems barbaric today, but in the early 1900's, hummingbird feathers and sometimes whole hummingbirds were used to decorate women's hats. Fortunately wearing dead birds held fashion for only a short period of time. By 1921, both the US and England passed laws limiting the feather trade.